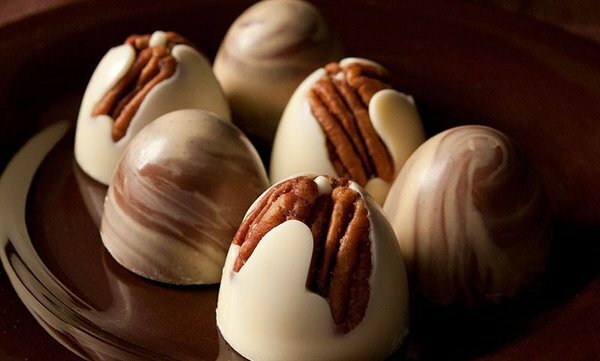 Display your passionate feelings with chocolates like dome truffles from Glacier Confection in Tulsa. Brighten up that special someone’s day with thoughtful treats procured from statewide shops. Carefully select an arsenal of chocolate truffles, bon-bons and bars created in Oklahoma, or customize an array of vibrant flowers with the help of longtime local florists to ensure your significant other feels loved. Add a touch of sweetness to your relationship with the official decadent dessert of love. From traditional truffles and health-minded, chocolate-covered fruits to whimsical chocolate roses and out-of-the-ordinary chocolate apples, local shops keep a diverse selection of chocolate goodies in stock. At Apple Tree Chocolate in Norman, a divine assortment of chocolate treasures awaits. While chocolate abounds in many shapes and sizes here, the main attraction remains the chocolate-covered caramel apples. With more than two dozen flavors of these gourmet caramel-chocolate hybrids, you may have to make a return trip or two between anniversaries to try them all. Shop owners are constantly tinkering with new creations, so with the variety of milk, dark and white chocolate offerings available at all times, you can’t go wrong with a quick trip south to pick out the perfect “I love you” sweet. For chocolate treats that are sure to sweeten a special occasion, head to Unique Confections in Norman. With a culinary artist at the helm, you can count on this treat shop to deliver delectable truffles with standout flavors. Gift recipients will bite into a tasty morsel of chocolate and catch hints of bacon, cayenne pepper, hazelnut, peach basil or one of the other unique ingredients chocolatier Andrew Marsh has used to delicious effect in his confections. Besides specialty truffles, you can also anticipate fine-tuned toffee chunks, nutty mendiant discs and chocolate espresso beans at this must-visit spot. A rainbow of highly detailed gourmet chocolates greets guests at Glacier Confection in Tulsa. Here, you can simply arrange a box of assorted chocolates based on your significant other’s favorites. Make selections based on color, shape and design, or dive deeper into groupings by flavor profile. At the end of the experience, leave with an eye-catching box of white chocolate key lime shells or birthday cake orbs, dark chocolate Mediterranean sea salt bars or milk chocolate peanut butter leaves. Located among the mountains in Broken Bow, WhipPoorWill Resort doubles as both a cozy cabin experience and a fudge shop. After warming up by the wood-burning fireplace, bundle up and head to the onsite Fudge Factory & Sweet Shoppe to sweeten the romantic retreat. You can stand at the counter and browse through the selection of chocolate, chocolate pecan, mint chocolate swirl, fudge with Butterfinger, amaretto chocolate swirl and chocolate walnut fudges before making your final selection. As an added bonus, you can pay a visit near the holidays and score a slice of raspberry chocolate swirl pie. Hit the soda fountain at Sooner Drug & Gifts in Okemah for an old-fashioned date revolving around chocolate. You can bring your loved one by to share sips of rich chocolate shakes or snag a bag of homemade chocolate cake truffles to go. Assorted truffles rotate on a regular basis, so celebrate a fall anniversary with pumpkin treats covered in a layer of white chocolate and bat sprinkles. Traditional chocolate lovers can also munch on milk chocolate truffles or cake dipped in dark chocolate served fresh daily. Show your feelings this Valentine’s Day with a selection of chocolate-covered nuts procured at The Peanut Shoppe in Calera. Whether your sweetie has a taste for peanuts, pecans, cashews or almonds, this snack and sweet shop has your gifting needs covered. Pick up a bag of white chocolate-covered peanut clusters or take home a package of chocolate caramel pecan patties. For less enthusiastic nut lovers, opt into a batch of chocolate-covered raisins, a handful of chocolate-covered milk balls or a sampling of chocolate-covered pretzels instead. Treat your crush to a twist on the classic dinner and a movie date; cue up Netflix and break out a bag of gourmet popcorn from Kernels & Kandies in Oklahoma City. Batches of chocolate-flavored kernels like Kernels Krunch will melt in your mouth, with its combination of buttery caramel, sea salt and drizzles of chocolate. Whenever you swing by for an order of popcorn, be sure to check out the other on-hand chocolate offerings, from the peanut-y Snickers and red velvet fudge to tins of chocolate clusters, truffle cakes and chocolate-dipped nuts. Express your love through chocolate gifts found at Nouveu: Atelier de Chocolat in Broken Arrow. As anniversaries, birthdays or Valentine’s Day draw near, reserve your box of chocolate-dipped strawberries, sticks of red marshmallow pops and bars of chocolate with heart-themed wrappers. Year-round, this sweet shop also crafts plenty of uniquely shaped Belgian chocolates like milk chocolate mice, dark chocolate shells and sophisticated swans. You can also score extra brownie points with your loved one with a warm cup of hot chocolate, best paired with chili pepper truffles or peanut butter ganache. Merge the traditional combination of chocolate and flowers into one delicious package at Bedre Fine Chocolate in Davis with an order of locally-crafted milk chocolate rose pops. Stop into the original Davis location for a generous supply of strawberry meltaways and hand-sculpted, Oklahoma-shaped chocolates. Chocolate fans across the state can also pay a visit to small business gift shops like Sovereign Fine Gifts & Bedre Chocolate, The Artesian Hotel and Bedre Cafe to secure Made in Oklahoma chocolate potato crisp bars, chocolate sodas, white chocolate fudge twists, cookie classic and chocolate-covered nut clusters. At Rick’s Fine Chocolates & Coffees in Guthrie, choose between treating your sweetheart to sips of chocolate or delectable bites of sugary goodness. Impress your loved one with a box of cookie bites and rich, dark chocolate truffles, or indulge in an order of coconut haystacks, cherry cordials, raspberry creams and peppermint patties. If the special someone in your life has a penchant for strong tastes and smooth coffee, take home a cup of chocolate raspberry bliss or a chilled wurtle chock full of creamy caramel, coffee and chocolate notes. Customize a cup of java or hot chocolate with shots of toasted marshmallow, white chocolate or pecan praline for an added bonus. Find other local chocolate & sweet shops here. Kick up the romance with a beautiful vase of fresh flowers, delivered right to your loved one’s doorstep. Stick with a pre-organized floral arrangement found at the florist, or stitch together your own recipe for a stunning assortment of colors. From roses and lilies to peonies and daisies, local flower shops are on-hand to pass on pieces of wisdom and create bouquets of flowers as radiant as your special someone. Head to A Date with Iris in Oklahoma City to put together a winning flower arrangement for an upcoming special occasion. Besides the shop staff, look out for the black shop cat, Didi, roaming around the store, pointing out succulents and flora that are sure to please. While perusing favorites like pink orchids, pastel roses and bright sunflowers, find something unique for your special someone. All types of magnificent plants and succulents, from edible celosia plants to stringy, purple maypops, can be found at this flower shop along Western Avenue. Brighten your loved one’s day with a blooming bouquet, hand-arranged at Broadway Flowers in Elk City. Group flowers together based on complementary colors or tie bold combinations of buds together with ornate strings and ribbons. This plant shop even offers one-of-a-kind vases for every occasion, like ceramic red heels and pumpkin pots, for the best way to display popping flowers like tiger lilies and asters. At this flower shop, pick a set of glittery roses and decorative butterflies sure to wow your sweetie, best paired with a set of edible cookies and cream stilettos filled with chocolate truffles. Commemorate a special anniversary with a personalized assortment of flowers, artfully arranged at Toni’s Flowers & Gifts in Tulsa. Here, order the house specialty, pavé-style arrangements featuring closely-bunched blooms, sometimes comprising shapes like birthday cakes and Valentine’s Day-themed hearts. Any type of plant can transform into a beautiful arrangement with the trained eye of one of the shop florists, from vibrant peonies, hyacinths and tulips to eucalyptus leaves, bromeliads and orchids. Shape an arrangement centering on pastel succulents or basil leaves in honor of your blossoming relationship. Gift a token of your love in the form of flowers discovered at The Little Shop of Flowers in Stillwater. Select the main feature of a bouquet from among red roses, purple daisies and pink tulips before garnishing the rest of the display with complementary greens and wheat stalks. Mix and match long-stemmed orchids with cut hyacinths for a towering array of blossoms, or stick to a simple vase of white carnations sharing space with bits of blue and red. Whether you’re creating a bouquet from scratch or taking the advice of professional florists, entrust The Little Shop of Flowers with your “just because” bouquet. Dazzle your spouse with the expertise of the Sunshine & Roses florists in Moore. Sit down for a one-on-one meeting with the shop owner to brainstorm the perfect bouquet for your loved one. Create sprawling baskets of carnations, leaves and baby’s breath, or place eucalyptus leaves, sunflowers and roses in a transparent vase for a unique effect. Combine twenty-five sprigs of lavender with twenty-five roses for a silver anniversary, or present a set of stunning daisies at the start of a date. Take your crush’s breath away with a special arrangement created by PJ’s Flower & Gifts in Del City. Place an order for a timely vase full of stargazer lilies, pink and red roses and white hydrangea, or devise your own custom bouquet to show you care. This local florist helps narrow down your love-themed options with a handy guide to the symbolism of certain plants. Gift a bunch of red roses in the name of love, or gather up an assortment of pink roses to highlight the strong foundation of your friendship. Place white tulips in a vase as a sign of forgiveness, or stick to pink carnations, to show your gratitude. Showcase your love for your partner with a personalized bouquet pieced together with the help of Petals & Pinecones in Minco. Select a beautiful bunch of flowers, and pick out the perfect unique vase like the handcrafted leather and lace option. While deciding between bold kalanchoe blossoms, distinctive Peruvian lilies and subtle white roses, be sure to add a Valentine’s Day treat for the kids, as well. Instead of traditional buds and stems, children will light up when they receive their assortment of candies, snacks and plush animals in a seasonal sweetheart pail with their name on the front. Surprise your spouse with an anniversary gift full of fragrance with the help of Flowers by Ramon in Lawton. Specializing in out-of-the-ordinary floral creations, this florist is sure to help you celebrate your anniversary with an extra touch of magic. Put in a request for a heart-shaped succulent and rose combination, or treat your loved one to a bouquet of pink and red roses and stargazer lilies, augmented with sprigs of greens. Bright bouquets are also on hand for bold personalities and neon enthusiasts. To further sweeten the deal, be sure to add a box of chocolates and a fuzzy, plush teddy bear to your order. Shower your loved one with tokens of affection from Thorn Originals in Perry, no matter the occasion. Arrange for a Valentine’s Day delivery, consisting of stunning reds and pinks sure to wow your special someone. Or, on your anniversary, watch as your sweetheart smiles and breathes in the fragrance of a custom arrangement of pastel carnations and pale asters tossed together with green succulents, sealed together with a silk ribbon. While taking a peek at the fresh cuts of daisies, lilies, asters and baby’s breath in this local flower shop, see if any on-hand Made in Oklahoma gifts, like lime pistachios, catch your eye, as well. Present your sweetheart with a bouquet of flowers befitting his or her personality with the expertise of Uptown Florist in Enid. For a loved one with a quirky sense of humor, pair pastel petals with a collection of cut green stems. When trying to treat your significant other like royalty, impress them with a set of purple lilies, grape hyacinths and lavender roses. This local florist even creates custom arrangements especially for men, like yellow daisies, tulips and alyssum presented in makeshift vases constructed out of opaque beer bottles. Find more local florists here.